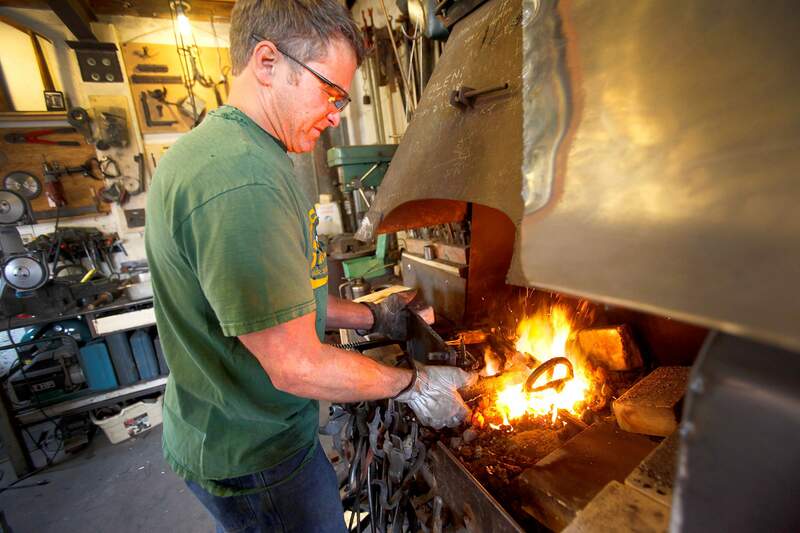 Mike Brieger spins his art piece Sewing Machine, which will be at the Furniture As Art Auction for KDUR, above the flame of a forge in his Durango studio. 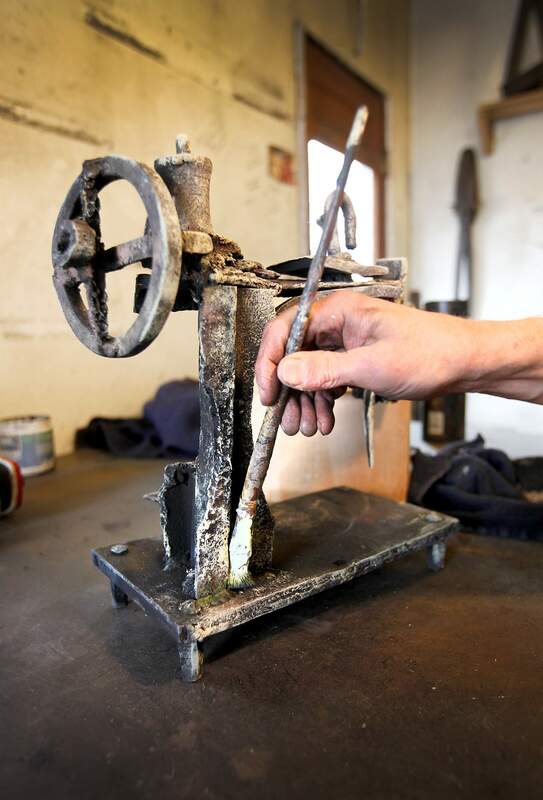 Mike Brieger puts finishing touches on his creation Sewing Machine, which will be up for auction Thursday night at KDURs 13th annual Furniture as Art at the Durango Arts Center. 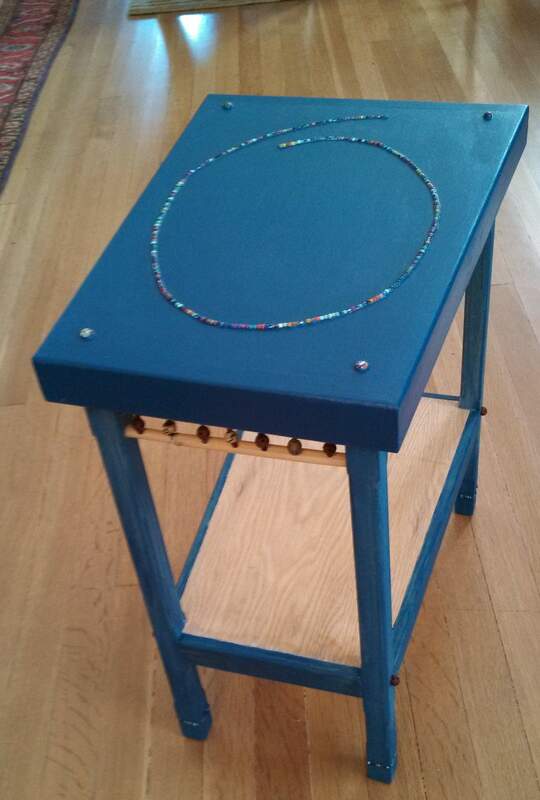 Ron and Carol Ozakis chair is on display at Beads & Beyond until Thursday, when it will go up for auction at KDURs Furniture as Art at the Durango Arts Center. 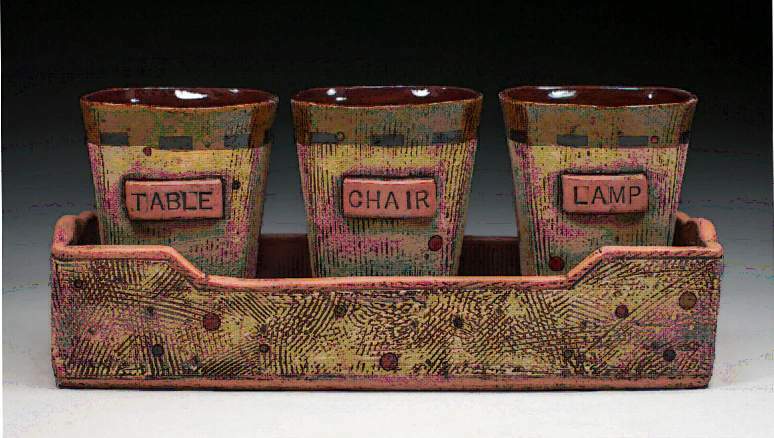 Lisa Pedolsky has contributed to KDURs Furniture as Art auction since its inception. Her ceramic piece is on display at the White Dragon Tea Room until Thursday, when it will go up for auction at Durango Arts Center. The paint may not be dry on all if the pieces for KDURs 13th annual Furniture as Art auction by Thursday night, but dont expect that to have any effect on the bidding. It never has. With 21 artists donating their time and materials for the live auction and more contributing to the silent auction, its a challenge to get every piece on stage in time for the event. But once theyre there, Furniture as Art typically brings in more than $10,000 to the Fort Lewis College community radio stations coffers. Its a pretty major event  our biggest off-campus fundraiser, said Bryant Liggett, KDUR station manager while speaking on the weekly Four Corners Arts Forum program. The variety of materials and concepts keeps Furniture as Art from getting stale, but this year theres something different. For the first time, KDUR staff members have created a piece. What started as a practical solution to an ongoing problem produced a fine item that should get the bidding off to a lively start. We had a sit-down with (artist) Lisa Pedolsky and said What can we do better? Liggett said. Pedolskys answer reflected the opinion of many artists. Nobody wants to go first, she said. KDUR Development Director Rachel Perrault suggested the staff members make a piece and have it take the first bullet on the auction block, when bidders are typically slow to push the sale price. The staff members coerced local builder and carpenter Jerry Olivier to build a shelf unit to be used, appropriately, for holding records. The staff members painted the shelves, and artist and KDUR board member Dan Groth put the finishing touches on the unique and surprisingly quality item. Many of the artists works are on display at local businesses until Thursdays auction, so potential bidders can get a preview. One not to miss is Tom Hahls entry at the Strater Hotel. Hahl is the woodworker for the historic landmark and created an original piece for Furniture as Art. Others will not be seen until Thursday, including a first-ever item. Debra Greenblatt, who coordinates the local Dumpster Beautification Program in which local artists turn garbage disposal units into works of art, is working on a smaller version  a trash can  for Furniture as Art. Photos arent yet available but word-of-mouth reviews are encouraging. The event is a sure-fire sellout every year. There were fewer than 100 tickets remaining as of Monday morning. Perrault said they go quickly because Furniture as Art is one of the premier showplaces for local artists to display a different side of the their work. Ive heard so many times from artists that this is the best art event of the year, Perrault said. Were in the business of raising money for KDUR, but its great that we can put on such a great art event, too. KDURs Furniture as Art live and silent auction will be held Thursday at Durango Arts Center, 802 East Second Ave. Doors open at 5:30 p.m., live auction begins at 6:30 p.m. Tickets cost $20 in advance, $25 at the door; VIP champagne tables for four are available for $120. Tickets are available at Marias Bookshop, 960 Main Ave. or at KDUR on the Fort Lewis College campus. For more information, call 247-7634 or visit www.kdur.org. Silent auction artists include Lorna Meaden, Paul Wilbert, Shawn Lotze, Sher Masor, Roxie Mitchell, Minna Jain, Betty Schwartz, Tess Jordan, Mary Chapel, Dan Groth, John Ford, Rebecca Turner, Brian Morrison the Felker Kids and more.